Educators are quick to tell students about the benefits of blogging, but slow to embrace them personally. Part of this is simply the immense work load educators take on these days but part of it is also the rut in which many educators find themselves in regards to approaching their work – and their students. Many educators understand that blogging can help nurture relationships with fellow education professionals and reach out to students academically but too many think the benefits stop there. Blogging – Why It Matters to Educators? Educators have always come together to exchange ideas, learn about new approaches in education and, of course, to simply vent their frustrations. While this has traditionally been done through user groups, informal social networks and both online and print journals, blogging has added a new element as well as new responsibilities. 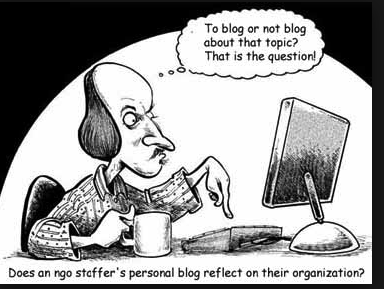 First, blogging forces educators to return to their roots by organizing their thoughts in order to write and post their opinions, observations and findings. Returning to the basics this way helps professionals organize their thoughts more effectively and puts them in a better position to help students who struggle with some of the same issues. An educator who blogs regularly can help students more effectively when it comes to organizing their essay structure, finding reliable resources and simply making the time to sit down and write. Blogging has become the best and most effective way to share and discuss new approaches in education and how to meet the challenges of the 21st Century classroom. For some students that means finding the ways to draw their attention back to education (and away from Angry Birds) while for others it means finding ways to integrate personal electronics, social media and memes into their curriculum. Students today are much more relaxed, confident and at home when sitting behind a keyboard. The same student who never says a word in class can prove to be the voice of a generation once they get home and are settled in behind their laptop, keyboard or tablet. Involving students in blogging not only encourages them to open up and respond to posts, it also gives them more insight into your own methods and the world of education in general. to have mature and motivated attitude to the education. They get the opportunity to see the things from an entirely different perspective and helps them to understand why education is important for their skills development and future opportunities. Teachers thus turn from 'enemies' and 'punishers' into mature friends, advisors, people who have experience and can be referred to with questions. Finally, it reinforces the idea that education isn’t just a phase in someone’s life – it’s a lifelong journey. Once they see that educators and professionals from every industry turn to blogging in order to connect with each other and encourage innovation, they’ll see the skills you’re trying so hard to teach them really do have a place outside your classroom. Of course, finding the right blog is all about knowing your audience and so teachers wrangling little kids will have different needs from those trying to help university students. But no matter where you fall on the academic spectrum, there’s a blog for you. With cute colors and bubbly graphics, it’s clear the Chalk Talk team is dedicated to their smaller students. But don’t let their cutie-pie approach throw you off – these teachers are serious about education and the content drives that home. Recent posts have focused on heavy topics like phonological awareness and how to encourage writing skills in preschool children. a site on academic writing created by college university instructor Tracy Collins. The author aims to provide students with tips, hints and guides to help them hone their writing skills and fall in love with writing process. She researches different methods of teaching writing and plans to share them with her colleagues and students in interactive way. Elementary age students need the right foundation in order to excel as they get older and blogs such as 4 the Love of Teaching combine observation with research to tell other educators about new classroom techniques, age appropriate books and even products and tricks teachers can use to stretch their supplies and budget without going broke … or insane. As kids approach middle school the challenges can increase with attention grabbing devices adding to the traditional mix of after-school activities and surging hormones making it difficult for kids to focus in class. The 2 Peas and a Dog blog focuses on this crucial age to help educators find ways to cut through the noise and distractions and reach students. It also offers a pretty comprehensive listing of related blogs for students from kindergarten through high school. Blogger Krystal Mills offers up plenty of help when it comes to technology and education. While her focus is on middle school students, the issues she raises can easily translate to lower high school students, particularly freshman who often feel as though they have one foot in middle school and the other in high school. If ever there was an academic phase that embraces insanity, it’s high school. he students are more diverse and so are is the pressure on teachers. Education is a central topic on this blog but the focus is also on arming students with skills they’ll need throughout their academic career and checking out new technologies that can help students and educators alike. Run as a part of the Inside Higher Ed website, the University of Venus encompasses a wealth of ideas and theories when it comes to education. It’s the perfect blog for teachers who want to expand their own techniques and find ways to deal with the politics of education within their curriculum. It offers practical advice such as dealing with student assessments as well as serious issues that affect educators directly such as the recent adjunct crisis. The Thinking Stick offers a bit of everything and appeals to educators at every level. If you’re teaching little kids, posts on clever ways to use Google Maps in the classroom can turn a simple geography lesson into something more engaging. Teachers educating older students will find plenty of help with reading strategies in the digital age. Writer Lisa Nielsen covers everything from how to incorporate social media in the classroom to how best to set up a classroom in order to help students pay attention and learn more effectively. Her approach is simple and clear-cut making her blog easy to read, search and put into practice. Following the best practice of educational blogging will help any teacher built stronger relations with their students and fellow educators and make valuable input into education development. Who knows – maybe soon we won't use any textbooks and blogging will be the only source of relevant information.